The Preservation Society of Newport County broke ground in early June, 2014, on an important historic preservation project at The Breakers. 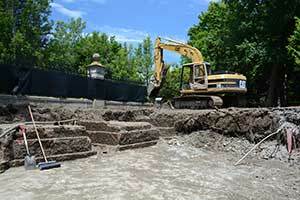 Repairs to the boundary fence and to the underground boiler room of The Breakers began with the removal of fence sections on Shepard Avenue, followed by dismantling of the masonry wall. "The need to repair the boiler r oom ceiling has been on our radar screen for quite some time," said Preservation Society CEO & Executive Director Trudy Coxe. "It's a unique historic structure that is being damaged by water leaks in the ceiling; we have to act now to preserve it." 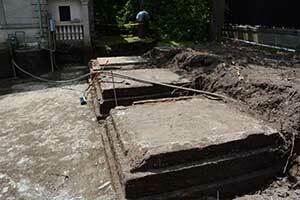 The roof of the boiler room, located under the expansive front lawn and behind the caretaker's cottage, was excavated and then waterproofed. New geofoam lightweight fill was then installed in place of all but the top two feet of soil, to lighten the load on the century-old boiler complex underground.